The Washington International Piano Festival, now in its sixth year at the Catholic University of America, always seems to happen when I am out of town. This summer's final concert, by pianist Santiago Rodriguez, fell on Sunday afternoon, just in time for me to hear it. Rodriguez, last under review two years ago at the Kapell Competition, once again put together a beautifully conceived and skilfully executed program. The theme, as he explained it in entertaining, off the cuff remarks (which included an informal survey of whether the audience needed a bathroom break), was the idea of improvisation contained within the composer's rigorous control. Two gigantic works were the focus, beginning with Bach's Chromatic Fantasy and Fugue, in which Rodriguez brought this concept of composer-controlled improvisation to life. With effortless fluency, he gave the fantasy's roulades many different shades, catching just the extemporaneous quality the genre demands. The fugue, taken at a jaunty tempo, was not in any way morose, its chromatic vagaries like the arching of an eyebrow. The Bach was mirrored on the second half with Beethoven's final piano sonata, op. 111, with its first-movement fugue, taken again rather fast, and the sense of improvisation woven into the manic variations movement. In his comments, Rodriguez rejected any association of this piece with an awareness of impending death in the composer's mind, characterizing it instead as a desperate grasp at life, heard in the variation movement. Evgeny Kissin's performance of the work last year will likely never be eclipsed, but Rodriguez got many things right, just not as shockingly so. Sprinkled through the rest of the program were miniatures of various kinds illustrating similar ideas. 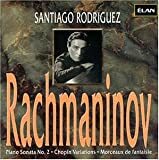 Rodriguez approached Manuel de Falla's Andaluza with the same kind of rhythmic freedom, allowing the melody of the slow section to sing beautifully, as well as in the improvisatory cast to Albéniz's Mallorca. He had a harder time making Antonio Soler's repetitive and overlong Fandango seem worthwhile, in spite of his virtuosic hand-crossings and bewildering variety of voicing. Marina, a piece by Thomas Sleeper in its Washington premiere, featured the most actual improvisation, as Rodriguez explained that the composer encouraged him to make the work his own. The triplet theme, redolent of a funeral march and used by many composers to signify death, seemed a little heavy-handed way to bring out the meaning of the T.S. Eliot poem that gave the piece its title.